Cool cars, Hunters Point edition. While marching up LIC’s 54th avenue recently, one encountered a fairly atypical vehicle parked in front of the WNBC building. 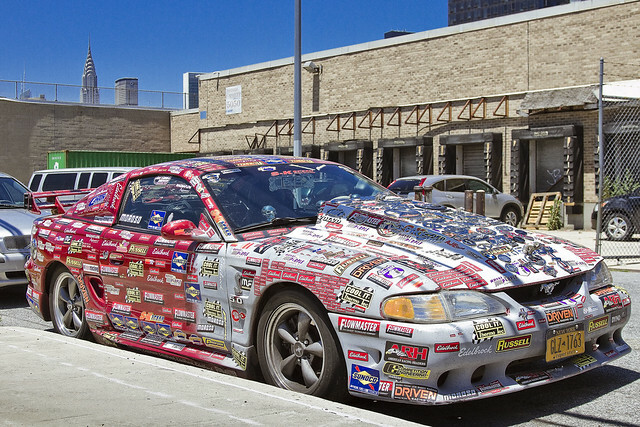 A humble narrator knows little about the world of car racing – never been a NASCAR or stock racing guy – but this Ford Mustang was highly modified and covered in sponsor logos. The hood scoop, in particular, had logos from several major car brands adorning it. The good news is that there were also chromium skulls on the dashboard, as you can sort of make out in the shot above. You absolutely never know what you’re going to encounter when walking the streets surrounding the fabulous Newtown Creek, which is the central artery of the Newtown Pentacle.